“The year is 1746. 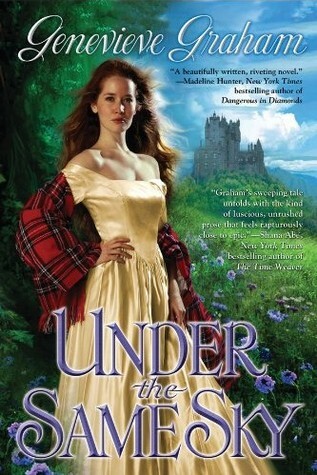 A young woman from South Carolina and a Scottish Highlander share an intimacy and devotion beyond their understanding. They have had visions of each other their entire lives. And yet they have never met. Now, with their lives torn asunder, Maggie Johnson and Andrew MacDonnell’s quest to find each other is guided only by their dreams— and by the belief in the true love they share. On the Carolina frontier Maggie Johnson’s family struggles to survive. Maggie’s gift of “the sight” and her visions show her a presence she calls Wolf. She watches him grow from a boy her age to a man even as she goes from child to woman. Andrew MacDonald has always wondered about the girl he sees in his dreams. He is able to talk to her through their thoughts and vows that even if he must cross an ocean he will find her. I had read other books by Canadian author Genevieve Graham within the past year, and finally got around to starting this series of books (a trilogy called The MacDonnells). It was an interesting read as I was curious as to how (and if!) the two main characters would find each other! The book is beautifully written in a style of writing that I really enjoyed, it was flowing and poetic. I’d recommend this to anyone who enjoys historical fiction with a bit of romance. I’m looking forward to continuing to read the rest of the books in this trilogy. *My progress for the Canadian Book Challenge is 13/13!! That’s amazing! Way to stick to your goals!! !